Guwahati, Apr 20 : A former deputy superintendent of police in Meghalaya has been keeping the force on its toes with a militant outfit he has launched. The police are struggling to contain a series of violent acts unleashed by the Garo National Liberation Army, and they have no clue about the whereabouts of its founder chairman, the former police officer. Champion R Sangma, who had quit the police to float the outfit in 2009, was supposedly arrested by security forces in Mymensingh in Bangladesh, according to reports that surfaced in November 2011. There was also news that it was his obsession with Facebook and social networking sites that had made it possible for the security forces to nab him. But no one in the Meghalaya government or police is sure or wants to say anything about the supposed arrest, other than admitting that there has been no official confirmation from across the border. Champion, whose real name is Pakchara R Sangma, is a postgraduate in philosophy from the Northeastern Hills University, Shillong. He was recruited to the Meghalaya Police Service as a DSP in 2004. But he remained on probation till 2009, until one day he disappeared. In early 2010, the police confirmed that the DySP, who had taken his service weapon, had set up an underground group. The government is on record that during the probation period, his attendance was irregular, his behaviour and conduct was not satisfactory and he had failed to improve himself despite repeated warnings. Police records say he was a habitual drinker. He hails from Songsak constituency in the backward East Garo Hills district, but the police do not have detailed records about his family background. Champion’s batch mates from the Northeastern Police Academy say he neither showed a militant streak nor carried the impression of a good policeman in the making. But, having trained in the elite academy, he was well-equipped with the latest methods of guerilla warfare and can handle sophisticated weapons. His outfit, its strength estimated at roughly 150, has over the past few weeks burned down 14 coal-laden trucks, abducted at least 12 persons, mostly belonging to coal firms and construction companies, and killed an eight-year old girl in a grenade attack. It has also been using minor boys, both as militants and as couriers to deliver extortion notes. The Meghalaya police have set the outfit a deadline for surrender, failing which there would be a major crackdown At the chief ministers’ meeting on internal security in Delhi, Mukul Sangma has sought more manpower and sophisticated weapons to wipe out the last remnants of terrorism, though he claimed that the overall law and order situation in Meghalaya was stable “barring a few pockets”. Whenever action is launched, he said, the militants slip through the border into Bangladesh. Speaking from Shilong, state director-general of police N Ramachandran said they have launched an offensive against the GNLA. “The self-styled area commander of the gang that burnt the coal trucks has been already killed in an encounter, while commander-in-chief Sohan D Shira had a narrow escape during a raid on a major hideout,” Ramachandran said. “We have also identified the main hideout of the GNLA inside the Dorama hills on the border of South Garo Hills and East Garo Hills districts. Security forces have closed in on it. We have information that there are about 100 boys there, quite a number of them minors, who are mostly unarmed. That is why we have given them a deadline, so that they do not unnecessarily get killed,” he said. Amid the confusion over where the GNLA’s founder chairman is, Ramachandran asserts that the outfit has serious internal problems, with commander-in-chief Shira no longer inclined to follow Champion Sangma’s diktat. “There is definitely a rift in the GNLA between the chairman and C-in-C, and that is now an open secret,” said Ramachandran. He cited reports that the arrest of several of Champion’s loyalists, too, had roots in the ongoing rift. Security forces last week gunned down Jeany C Momin, “action commander” . Champion, incidentally, is not the first policeman in Meghalaya to have quit to float a rebel outfit. 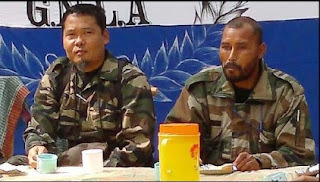 In 2005, Peter Marak, a commando with the Special Operation Team in Meghalaya Police, had formed the Liberation of Achik Elite Force after quitting his job. He fought the Assembly polls that year, and lost.